In a pot, bring some water to a boil, add salt and cook pasta according to package instructions until al dente. In the meantime, preheat oven to 200°C/390°F. Remove the core of the bell peppers and cut into thin slices. Halve zucchini lengthwise, quarter eggplant, and halve mushrooms. Slice zucchini, eggplant, and mushrooms and transfer to a bowl. Add olive oil, rosemary, salt, and pepper to the bowl with the vegetables and mix well. Transfer to a parchment-lined baking sheet in an even layer. Roast in oven at 200°C/390°F for approx. 15 – 20 min. For the pesto, pluck basil leaves from stems and add to a food processor with the walnuts, parmesan, olive oil, and some salt and blend into a paste. Transfer cooked pasta to a bowl and fold in the pesto. Halve the cherry tomatoes and add to the pasta along with the drained olives. 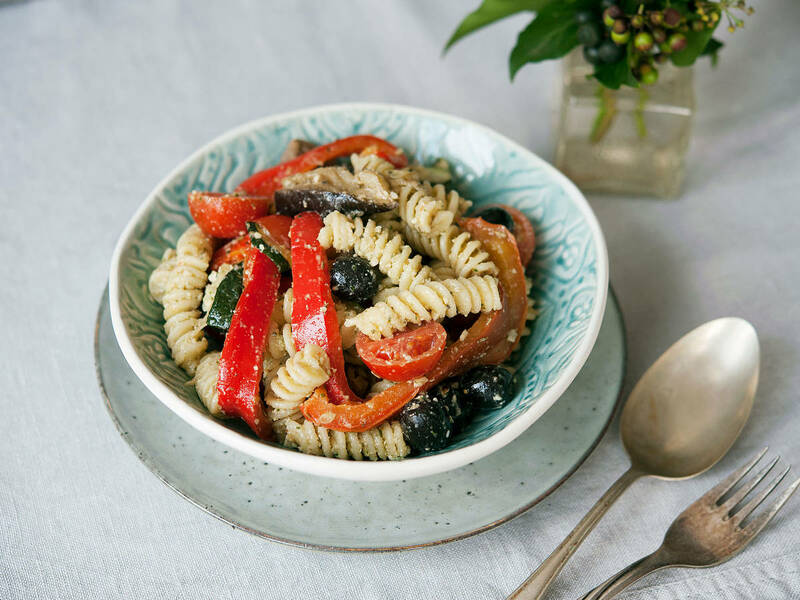 Let the roasted vegetables cool slightly, then add them to the pasta salad. Fold in grated Parmesan cheese and season with salt and pepper to taste. Enjoy!